"We've been doing a ton of work to play musical chairs with all these (pumps) so we can have good available spares," flight controller Alex Apyan said from Houston during the spacewalk. Each 235-pound pump, the size of a flat box, is about 3 feet by 2.5 feet by 1.5 foot. Feustel and Arnold also installed a new camera and communication device, and even accomplished some extra chores. 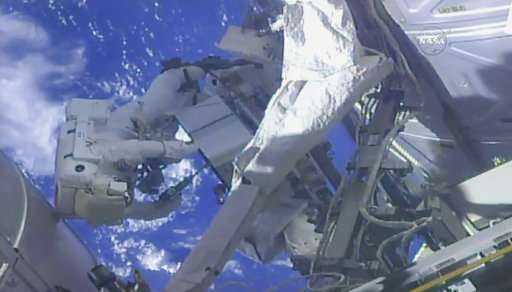 "Nice work," Mission Control said as the 6 1/2-hour spacewalk came to a close. "All right, guys, we are ready for you all to start heading home." 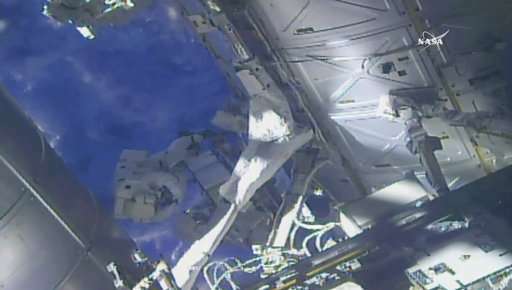 The spacewalkers laughed and shared jokes as they floated back inside. "Anyone home? Trick or treat!" one of them jokingly called out. Imagine finding out you need to do this halfway to mars. The ISS was constructed in large part to mature the technology and procedures necesary for interplanetary travel.